We've been talking about passion in my high school English classes for the past two weeks. No, not quite like that. 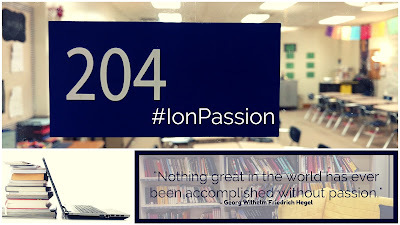 Much like the unit I introduced last year, we began our tenth grade inquiry projects about two weeks ago, which this year we've dubbed our #IonPassion Projects (get it? "Ion"...for Ionia), with an exploration of the roots of the word passion. Students explored how our passions differ from our interests or even our hobbies. In our discussion, we returned to our very first day of school, where following a failed attempt at folding origami cranes, we learned the importance of failing. Students remembered me saying that I wanted them to fail. I did say this. I want them to take risks, try new things, and fail in order to discover just how resilient they are. We don't learn by staying inside our comfort zones; we learn when we try out new ideas, new ways of thinking. During our discussion of what makes something a passion, students returned to this idea. A passion is something that we will continue to pursue despite setbacks and adversity. Our passion, as Angela Maiers has pointed out, is what we are willing to suffer for. And it turns out, I have a variety of passions sitting in my tenth grade English classes! So now we're looking to connect our passions with experts in a variety of fields. My tenth grade English students have carefully crafted their inquiry questions, found mentor texts, written their initial inquiry proposals, and outlined their action plans for our #IonPassion research projects. But now we need some help. You'll find my students' research blogs linked below. Roll over each picture to find a description and link to each student's blog. We'd love to hear your ideas and feedback. In addition to consulting mentor texts, we are looking for mentors to help us learn more about our inquiry topics. Do you have a passion for photography or mixing music? We are looking to interview, either in person or via email, experts. Please take a few moments to review our inquiry questions below, and if you wouldn't mind if one of my students contacting you, add your name and information to the columns on the right on our list below. CLICK HERE FOR ACCESS TO THE FULL SHEET.